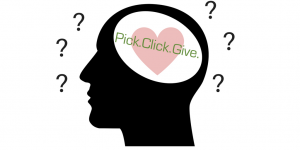 Help us understand why you give (or not) through Pick.Click.Give. | Pick.Click.Give. Help us understand why you give (or not) through Pick.Click.Give. Please help us understand why Alaskans choose to give -or not give- through Pick.Click.Give. Your response will impact how we can better serve donors and nonprofits in the future! Take the 4 minute survey here.